Posted in: Arrests, Crime Prevention, Media Release. Tagged: Pace. An Atlanta woman was arrested over the weekend after a credit card fraud alert and quick-thinking victim led police to her Cool Springs hotel room. Franklin Police responded to the Embassy Suites Saturday morning after an Alabama woman’s credit card company detected fraudulent activity on her account. The victim, who was still in possession of her card, was surprised to learn that an apparent cloned card was being used to pay for a hotel room in Tennessee. 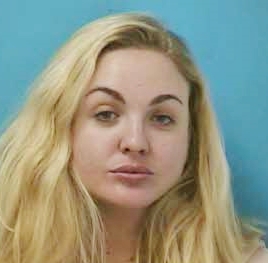 Officers found 26-year-old Chloe Cartwright of Atlanta in that hotel room, along with several store gift cards, pre-paid credit cards, receipts, and nearly $1,500 in cash. Cartwright is formerly from the middle Tennessee area. Charged with Identity Theft and Fraudulent Use of a Credit Card, Cartwright is free on the $12,500 bond set by the Magistrate. She is due in court on October 6. An investigation is underway that could result in additional charges. Had it not been for the credit card company fraud alert and quick-acting victim, Saturday’s arrest would not have been possible.